"New Hampshire Birth Records, Early to 1900," database with images, FamilySearch (https://familysearch.org/ark:/61903/1:1:FLGT-YP6 : 12 December 2014), Robert Ordway, 21 Jun 1797; citing Bow, Merrimack, New Hampshire, United States, Bureau of Vital Records and Health Statistics, Concord; FHL microfilm 1,001,026. New Hampshire Statesman, , Saturday, August 29, 1857; Issue 1891; col B. "Supreme Judicial Court." Treasurer’s Statement of Receipts and Expenditures of the County of Merrimack, for the Year Ending February 21, 1860 Receipts Arthur L. Graves, County Treasurer. 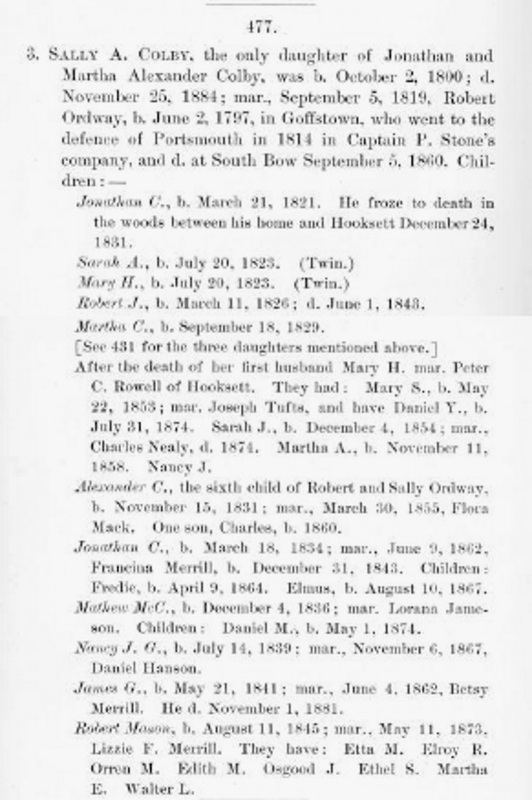 "New Hampshire Births and Christenings, 1714-1904," database, FamilySearch (https://familysearch.org/ark:/61903/1:1:FDJ5-YY9 : 12 December 2014), Sarah A. Ordway, 20 Jul 1823; citing BOW,MERRIMACK,NEW HAMPSHIRE; FHL microfilm 0015553 IT 14. ..... He was living in the family of Joseph C. Meriam, a blacksmith, and his wife, Sarah C. Meriam. Independent Statesman, Concord, NH: , Thursday, July 10, 1879; pg. 327; Issue 41; col D. "Conveyances in Merrimack County for the Week Ending June 25, 1879." Independent Statesman, Concord, NH: , Thursday, July 21, 1881; pg. 336; Issue 42; col C "Conveyances in Merrimack County for the Week Ending July 9, 1881." COLBY FAMILY & OTHERS, at http://freepages.genealogy.rootsweb.com/~colby/colbyfam/d391.html citing FHL Number 1;000988 Birth and Marriage Index for New Hampshire. COLBY FAMILY & OTHERS at http://freepages.genealogy.rootsweb.com/~colby/colbyfam, /d391.html. Mary Ormsbey was born perhaps about 1661. James N. Arnold, Vital record of Rehoboth, 1642-1896 : marriages, intentions, births, deaths, Providence, R. I.: Narraganset Historical Publishing Company, (1897) , p. 496. Representative Men and Old Families of Rhode Island, , at https://books.google.com/books?id=JK8yAQAAMAAJ . Chicago: J.H. Beers & Company, (1908) , p. 1773. Janet K. Pease and Robert S. Wakefield, "Additions to the family of Hugh Cole (ca. 1627-1699) of Swansea, Mass. ", The American Genealogist, Vol. 64, (1989) , p. 141. Therese Orne was born perhaps about 1817. 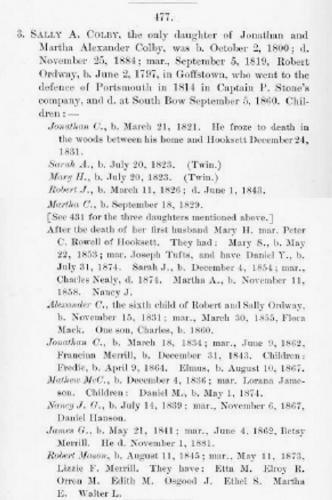 "Massachusetts Deaths, 1841-1915," database with images, FamilySearch (https://familysearch.org/ark:/61903/1:1:N7BH-3LD : 10 December 2014), Terese Orne Hinckley, 28 Aug 1844; citing Milton, Massachusetts, v 15 p 72, State Archives, Boston; FHL microfilm 959,807. "Massachusetts Births and Christenings, 1639-1915," database, FamilySearch (https://familysearch.org/ark:/61903/1:1:FHGM-7MB : 4 December 2014), Judee Osgood, 17 Oct 1716; citing Salisbury, Norfolk, Massachusetts, 176; FHL microfilm 877,468. "Massachusetts Marriages, 1695-1910," database, FamilySearch (https://familysearch.org/ark:/61903/1:1:FH15-HWR : 4 December 2014), Nehemiah French and Judith Osgood, 13 Nov 1735; citing reference 99; FHL microfilm 877,468. 1900 United States. Census Office. 12th census, 1900 population census schedules, Washington, District of Columbia: Bureau of the Census Micro-Film Laboratory, ([197-]) , Census Place: Portland Ward 7, Multnomah, Oregon; Roll: 1350; Page: 4B; Enumeration District: 0066; FHL microfilm: 1241350. Nelson married Nellie Spencer, daughter of Lawrence Halsey Spencer and Louisa H. Roys, on June 10, 1886. Nelson C. Ovaitt and Nellie Spencer lived at Ocean City, Cape May County, New Jersey. Nelson died in Philadelphia, Philadelphia County, Pennsylvania. Augustine George Hibbard, History of the town of Goshen, Connecticut, , at https://books.google.com/books?id=OutSAAAAYAAJ . Hartford, Conn.: Press of the Case, Lockwood & Brainard Co., (1897) , p. 423. Gertrude Van Rensselaer Wickham, Memorial to the Pioneer Women of the Western Reserve, Vol. 1, , at https://books.google.com/books?id=vgNJAQAAMAAJ . (1896) , p. 240. Vital Records of Brockton Massachusetts to the year 1850, , at https://archive.org/details/vitalrecordsofbr00broc . Boston, Mass. : New England Genealogical Historic Society at the charge of the Eddy Town-Record Fund, (1911) , p. 110.